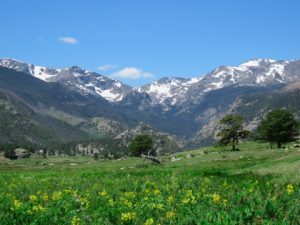 If you’ve never made the trek to Estes Park, then you may not know about the prolific splendor of flowers that bloom here in the spring and summer. And as the snow has begun to melt, we can already see signs of new growth throughout Estes and Rocky Mountain National Park (RMNP). Here at Rams Horn Village Resort, spring always proves to be an exciting time to view wildflowers in bloom, and we encourage our guests to take to the trails as the temperatures rise, so that they can take in the sights and smells of our local flora. If you’re a flower lover, you’ll cherish your time at our resort. We recommend that folks book a stay with us from May through July to experience the best blooms. Here are a few flowers that you can look forward to seeing when you visit us this May! Rocky Mountain pussytoes are common throughout Estes Park and RMNP. You can often identify this species thanks to the soft petals that sprout out near the ground. Where to look: Rocky Mountain pussytoes can be found on almost all terrain below treeline in Estes Valley and RMNP. When to look: Rocky Mountain pussytoes begin popping up in early May, as soon as the snow starts melting. What to look for: Look for bundled white flowers on top of a straight stem, with velvety arrowhead-shaped petals at its base. Each flower has a tiny pistil that shoots outward from the center of its petals. Bristly pricklypoppy isn’t just fun to say, these flowers are beautiful to behold. Like other poppies, these flowers are two-toned (in white and yellow), and you can identify the flower by the prickly leaves along its stem. Where to look: Look for bristly pricklypoppy in mountainous areas. You can find bristly pricklypoppy along many trails throughout RMNP! When to look: Bristly pricklypoppy begins to bloom in late May, and continues to bloom through August. Warmer weather may trigger pricklypoppy to bloom earlier. What to look for: Look for flowers with white, clothlike petals and surrounding a ball of cheerful yellow stamens. Also, take note, these flowers have prickly stems and leaves, so be careful! Field mouse-ear chickweed may be a mouthful, but these flowers are aptly named. You’ll find these little flowers in high alpine fields and meadows throughout Estes and RMNP, and you’ll notice that their white petals look like tiny mouse ears! Where to look: Look for field mouse-ear chickweed in mountain meadows, even near treeline. When to look: Field mouse-ear chickweed has a short blooming season in May and June. What to look for: Field mouse-ear chickweed produce a flurry of tiny flowers whose heart-shaped, white petals meet at a small bundle of yellow stamen. Each flower features five pedals with a split at the center of each petal — giving the petals their heart shape. Fremont geraniums are sticky, pink and purple flowers whose delicate petals feature thin veins of darker purple. Individual flowers will sprout from a bundle of parsley-shaped leaves. Where to look: Fremont geraniums are popular in drier mountainous forests, as well as alpine meadows. When to look: Fremont geraniums bloom throughout spring and summer, beginning their bloom in the middle of May. What to look for: These flowers have five petals, with dark veins that point to playful pistils that proudly jut out from the center of the flower. The center of the flower may be yellow or green. While you might not expect to find cacti throughout the park, you’ll be delighted by the ball cactus that you can find on the drier slopes in the region. 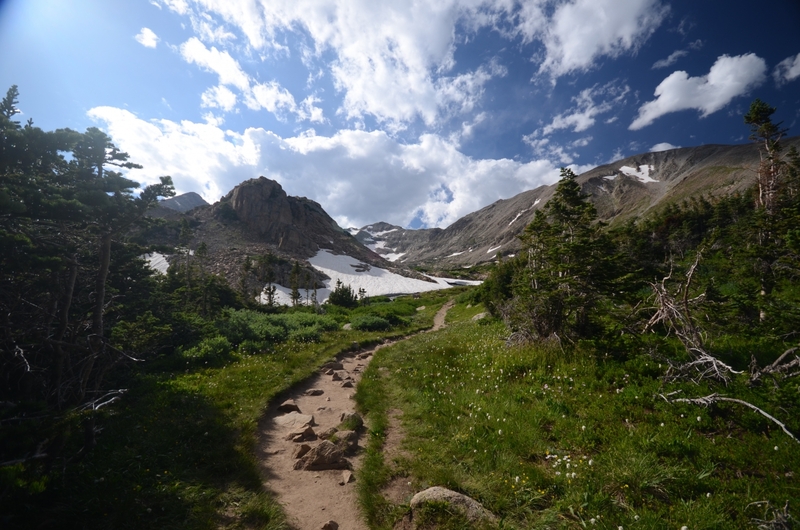 Where to look: Look for arid, rocky terrain throughout Rocky Mountain National Park. When to look: These cacti bloom as early as April, and can be seen blooming through summer. Blooms are most common after rainfall. What to look for: As the name implies, these cacti are ball-shaped, with pointed spines pluming out from each of the bumps along the cactus. When in bloom, ball cactus will display pink and purple flowers that bunch up atop the cactus. These flowers have many layers of pillows that get lighter as they approach the center of the flower. Small, delicate, and vibrant, you’ll find parry primrose in the wettest habitats throughout RMNP. Look for this pink flower along streams, rivers, and lakes throughout the region. Where to look: Parry primrose is most common near water, and it relies on snow melt to thrive as spring rolls around. Look along the banks of watershed areas, below treeline. When to look: The bloom of the parry primrose comes with snow melt. Look for these flowers in early spring. What to look for: Parry primrose flowers are pink and yellow, featuring five tiny petals around a yellow center. Flowers bloom in clusters, and the base of these flowers is marked by lush, long leaves that soak up winter’s snow. Alpine forget-me-nots are uniquely blue, and they produce a firework of small flowers stemming just above a compact collection of leaves. Be sure to enjoy the smell of these flowers when you come upon them! Where to look: You can find alpine forget-me-nots in dry meadows, even above treeline throughout RMNP. When to look: This is one of the earliest high-altitude flower species to bloom. Look for these blue flowers between May and July. What to look for: Look for an exciting cluster of blue flowers with yellow and black eyes at their center. The leaves of these flowers are slightly larger than the flowers themselves. You can also find varieties that are more purple than blue. With a name like “mountain iris” it’s no wonder why these cherished flowers proliferate throughout the Park. Look for light purple flowers whose centers transform into intricate patterns of white and yellow. Where to look: Mountain iris love moisture, and you’ll find them sprinkled throughout meadows that receive moisture from rain and snow melt here in Estes and RMNP. When to look: Mountain iris bloom throughout late spring and early summer. You can find these purple flowers opening up between late May and July. What to look for: Look for flowers with purple-tipped petals. Each petal has textured purple veins that bleed into white and yellow coloring as they approach the center of the flower. These flowers have a long stem and grassy leaves. Pasqueflower are rather odd flowers that pop up very early in the blooming season. These purple, blue, and white flowers pop up before most others, and they’re common around treeline. Where to look: Look for pasqueflower at treeline elevations on slopes that are exposed. Pasqueflower is often found in rocky, sandy terrain, where the soil drains quickly. When to look: You can see pasqueflower in bloom as early as March, though these flowers continue to produce through July. What to look for: Pasqueflower sprouts from stems in the ground before producing leaves. You’ll often find a set of a few flowers bundled together. The flower of the pasqueflower is light purple and white, and the stamens are yellow during the initial bloom. After blooming, the flower will drop its petals, leaving thin stamen jutting out from the stem. Golden banner flowers are a flurry of small yellow flowers that pop up just above the leaves of their stems. When to look: Golden banners can be seen blooming in late May, and they continue to bloom through summer. What to look for: Look for sprigs of flowers numbering about a dozen or so shooting up from a single stem. These small yellow flowers eventually turn to pods, leaving sees for the next year. While in bloom, each individual flower will have five distinct petals. Heartleaf arnicas are bright yellow, and they can be easily spotted throughout the Park, thanks to the height of their stems. Where to look: Look for this arnica flower in drier areas throughout RMNP, as well as forested areas. When to look: Heartleaf arnica begin to bloom in late May, and continue to bloom throughout all of summer. What to look for: These flowers have yellow petals, as well as yellow stamen. The leaves of these flowers are heart-shaped. You’ll find these flowers sitting high atop long stems, and each flower may feature a dozen or so petals. If you’re looking for the perfect place to stay as you make for the mountains to discover the splendor of flowers, Rams Horn Village couldn’t be more convenient. We’re located just blocks away from downtown Estes Park, right near the entrance to Rocky Mountain National Park. We’re surrounded by a flower-lovers paradise, and we’re certain that you’ll enjoy the beautiful mountain species that the Park has to offer. Book a stay with us today, and be sure to pack a camera for the many flower species you’ll discover!